Designed for access layer converged data,video and voice applications,the ZyXEL GS2210 series has a rich Layer 2 feature set that can shape the traffic for diverse VoIP,video conference,IPTV and IP surveillance deployments. Supporting L2 multicast and IGMP snooping,the GS2210 series can support large IPTV deployments,while using bandwidth efficiently by directing multicast traffic to the subscribers only. The Multicast VLAN Registration (MVR) function ensures better network security by allowing a single multicast VLAN to be shared in the network while subscribers remain in separate VLANs. In terms of voice,the GS2210 switch uses OUI to detect compliant IP phones,and then assigns the delay-sensitive VoIP traffic to a dedicated voice VLAN with appropriate QoS prioritization. These advanced traffic control features of the GS2210 series provide hotels,businesses and educational institutions greater agility and more effective traffic management for the converged applications of today. 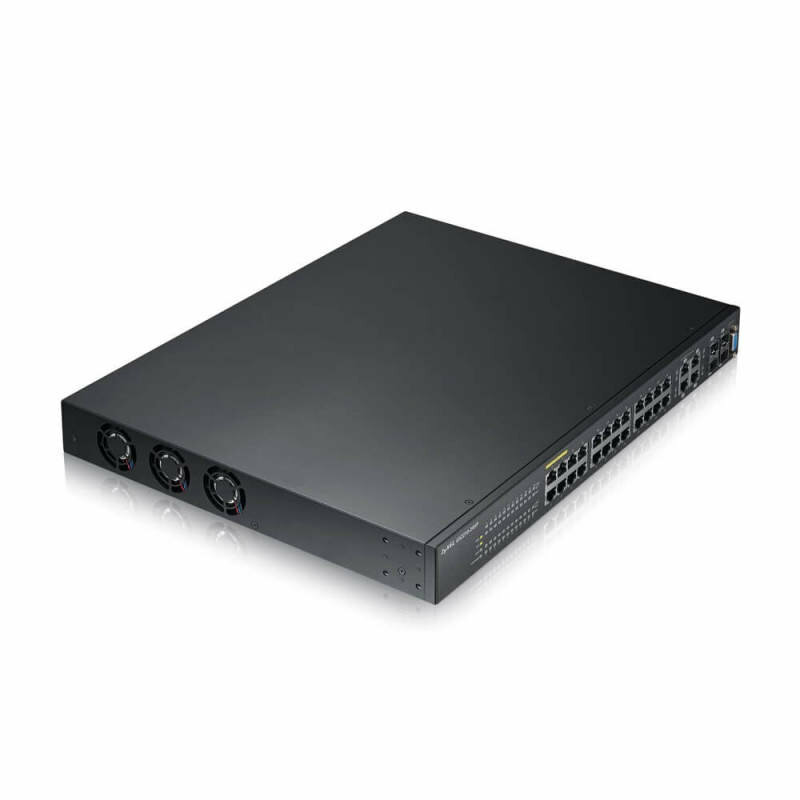 The ZyXEL GS2210 series PoE switches feature advanced and intelligent PoE functions that simplify and lower the cost of PoE deployments such as IP telephony,WLAN and IP surveillance. This series of L2 PoE switches support the IEEE 802.3af PoE and 802.3at PoE Plus standards,which provide up to 30 watts of power per port for advanced Powered Devices (PD) like 802.11ac wireless APs and video IP phones. The high power budget of 375 watts enables the GS2210 PoE switches to comfortably accommodate the PDs required in a modern network edge. The intelligent PoE technology used in the GS2210 PoE switches enables more efficient use of power resources that delivers better ROI for businesses. Setting the PoE switch to consumption mode,it can automatically detect the power consumption status of each powered device and supply only the amount of power required. This intelligent power allocation function minimizes the waste of unused power,helps businesses save money,and enables the PoE switch to power more PDs. Equipped with an extensive array of access security,traffic security and network storm protection features,the ZyXEL GS2210 series offers enhanced control and isolation for improved convergence of video,voice and data. Such advanced defense mechanisms as IP source guard,DHCP snooping,and ARP inspection can detect and block intentional network attacks. The CPU protection function ensures normal switch operation by preventing malicious traffic from trying to shut down the switch. Combining multiple L2,L3 and L4 filtering mechanisms with such education- and hospitality-friendly features as MAC freeze,port isolation and guest VLAN,the ZyXEL GS2210 series offers a high level of security,flexibility and control for diverse access layer deployments. The ZyXEL GS2210 series helps businesses and organizations stay ahead and get ready for future IPv6 networks. It supports dual stack (IPv4 and IPv6) and IPv6 host that allows businesses and organizations to deploy the GS2210 switch at the network edge today,and easily migrate to the next-generation Internet Protocol in the future. With support for IPv6 ACL packet filtering,the GS2210 L2 gigabit switch can create secured IPv6 networks that are protected from illegal IPv6 clients. The GS2210 series is designed with a comprehensive set of IPv6 management features that include ICMPv6,neighbor discovery and DHCPv6 relay,which facilitate the migration to next-generation networking applications without an extensive equipment upgrade. Part of the ZyXEL one network experience,the GS2210 series supports ZON utility and innovative inter-device features to deliver the easiest,most efficient network setup and management for businesses. The ZyXEL One Network inter-device features allow the switch to discover neighbor ZyXEL devices so users can see what devices are connected to the switch,what ports are used,device IP and even firmware version. From there,users can easily access neighbor device GUIs with one click.